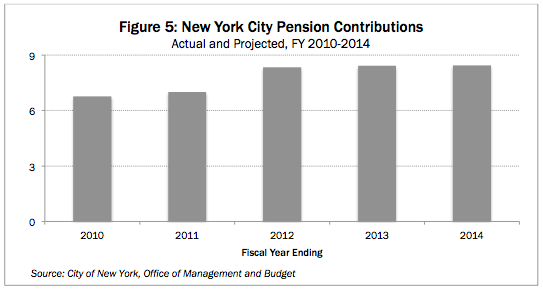 Public pension costs in New York are mushrooming—just when taxpayers can least afford it. Over the next five years, tax-funded annual contributions to the New York State Teachers’ Retirement System (NYSTRS) will more than quadruple, while contributions to the New York State and Local Retirement System (NYSLRS) will more than double, according to estimates presented in this report. New York City’s budgeted pension costs, which already have increased tenfold in the past decade, will rise by at least 20 percent more in the next three years, according to the city’s financial plan projections. NYSTRS and NYSLRS are “fully funded” by government actuarial standards, but we estimate they have combined funding shortfalls of $120 billion when their liabilities are measured using private-sector accounting rules. Based on a similar alternative standard, New York City’s pension funds had unfunded liabilities of $76 billion as of mid-2008—before their net asset values plunged in the wake of the financial crisis. The run-up in pension costs threatens to divert scarce resources from essential public services during a time of extreme fiscal and economic stress for every level of government. New York needs to enact fundamental pension reform to permanently eliminate the risks and unpredictability inherent in the traditional pension system. The bomb is now exploding—and New Yorkers will be coping with the fallout for years to come. New York’s state and local taxpayers support three public pension funds encompassing eight different retirement systems—five covering different groups of New York City employees, and three covering employees of the state, local governments, school districts and public authorities outside the city. Between 2007 and 2009, these funds lost a collective total of more than $109 billion, or 29 percent of their combined assets. Two of the three funds ended their 2010 fiscal years with asset values below fiscal 2000 levels; the third has barely grown in the past decade. Meanwhile, the number of pension fund retirees and other beneficiaries has risen 20 percent and total pension benefit payments have doubled in the past 10 years. Taxpayers will now have to make up for the resulting pension fund shortfalls. Taxpayer contributions to NYSTRS could more than quadruple, rising from about $900 million as of 2010-11 to about $4.5 billion by 2015-16. The projected increase is equivalent to 18 percent of current school property tax levies. State and local employer contributions to NYSLRS will more than double over the next five years, adding nearly $4 billion to annual taxpayer costs even if most opt to convert a portion of their higher pension bills into IOUs that won’t be paid off until the 2020s. New York City’s budgeted pension contributions, which already have in-creased by more than 500 percent ($5.8 billion) in the last decade, are projected to increase at least 20 percent more, or $1.4 billion, in the next three years. Pension costs would be even higher if New York’s state and local retirement funds were not calculating pension contributions based on permissive government accounting standards, which allow them to understate their true liabilities. While New York’s two state pension systems officially are deemed “fully funded,” we estimate that NYSLRS is $71 billion short of what it will need to fund its pension obligations, and that NYSTRS has a funding shortfall of $49 billion, based on valuation standards applied to corporate pension funds. 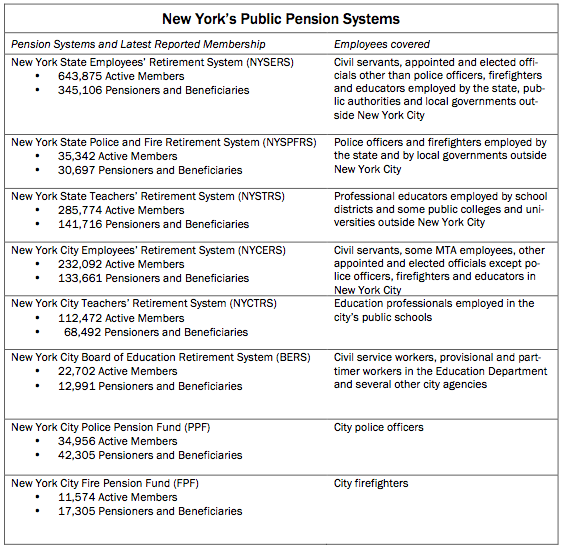 New York City’s pension systems are not as flush as NYSLRS and NYSTRS, which is the main reason why the city spends more for pension contributions than all of the state’s other public employers combined. The official “funded ratios” for the five city retirement systems ranged from 56 percent to 80 percent as of June 30, 2008. This would indicate they were $42 billion below fully funded status before the financial market meltdown wiped out more than 20 percent of their net assets. However, the city actuary also has computed alternative measures of funded status based on the kind of more conservative assumptions used in the private sector. These measures show the city’s pension system was underfunded by $76 billion in 2008. The shortfalls in the city systems undoubtedly have grown much larger in the last two years, but the full dimensions of the problem won’t be known until the pension plans issue their financial reports for fiscal 2010. In the short run, assuming the state Constitution is interpreted as allowing no change in benefits for current workers, there is no financially responsible way to avoid the coming increases in pensions costs. However, state and local officials in New York can seek to contain the damage by reducing headcount where appropriate, and by exploring ways of saving money on employee compensation, including wage increases and health insurance benefits. A statewide public-sector salary freeze—which the Legislature has the power to impose, according to a legal analysis commissioned by the Empire Center  – could help minimize the extent to which rising pension costs force service cutbacks, layoffs or tax hikes. But these will just be bandages covering a more fundamental problem. The lesson is clear: the traditional pension system exposes taxpayers to intolerable levels of financial risk and volatility. New York’s existing defined-benefit (DB) public pension plans need to be closed to new members, once and for all. They should be replaced either by defined-contribution (DC) plans modeled on the 401(k) accounts that most private workers rely for their own retirement, or by “hybrid” plans, combining elements of DB and DC plans, that cap benefits and require employees to share in some of the financial risks of retirement planning. This is not just a matter of financial necessity but of basic fairness to current and future taxpayers—the vast majority of whom will never receive anything approaching the costly, guaranteed benefits available to public employees. New York’s 1.3 million state and local government employees belong to defined-benefit (DB) pension plans, which guarantee a stream of post-retirement income based on peak average salaries and career duration. Pension (and disability) benefits are financed by large investment pools, which in turn are replenished by tax-funded employer contributions. Some public employees, depending on their hiring date and “tier” membership, also contribute a small share of their own salaries to pension funds (see Appendix). While employee contributions (where required) are fixed or capped, contributions by employers fluctuate, based on actuarial assumptions. The rate of return on pension fund assets is the key determinant of pension costs to taxpayers. Since the mid-1980s, when pension funds began allocating more of their assets to stock investments, those rate of return assumptions have ranged from 7.5 percent to 8.75 percent; for most of the last 10 years, New York’s public pension plans have assumed their investments would yield an average annual return of 8 percent. During the historic bull market of the 1980s and ‘90s, investment gains easily exceeded expectations, averaging in the double digits. 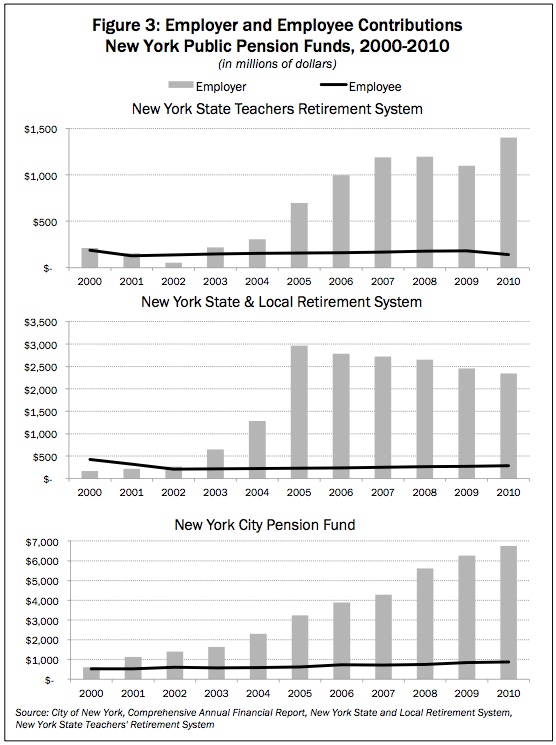 The result, as shown in Figure 1: tax-funded employer contributions tumbled in the three state pension plans covering employees outside New York City. By 2000, employer contribution rates for members of these plans essentially had dropped to zero. Government workers shared in the market windfall. The state Legislature repeatedly increased pension benefits for targeted groups of employees during the 1990s. Those enhancements were topped off in 2000 by the state Legislature’s approval of cost-of-living adjustments in all public pensions, automatic partial indexing to inflation of future pension payments, and the permanent elimination of employee contributions for Tier 3 and 4 retirement system members who had been on the payroll for at least 10 years. Lawmakers essentially sold these changes to the public as a free lunch, assuming the stock market boom would continue indefinitely. In fact, as elected officials should have recognized, the minimal employer contribution rates of 1990s were a historical anomaly. “Normal” contribution rates—assuming a hypothetical steady state of asset returns meeting investment targets—would have ranged from 11 to 12 percent for most non-uniformed state and local employees, including teachers, to nearly 20 percent for most police and firefighters in NYSLRS. The decade that followed the enactment of the major pension sweeteners was characterized by extremely volatile—and ultimately stagnant—investment returns. Asset values dropped sharply between 2000 and 2002, recovered over the next five years, and then dropped sharply after 2007. 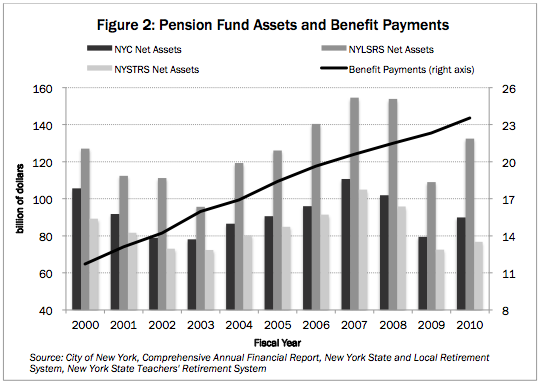 Despite the recent stock market recovery, the net assets of the New York City pension funds and the New York State Teachers’ Retirement System (NYSTRS) as of 2010 were still below 2000 levels, while the net assets of the New York State and Local Retirement System (NYSLRS) were up just 4 percent on the decade. * Meanwhile, total benefit payments doubled between 2000 and 2010. The year-by-year trends for the period are shown in Figure 2. The combination of falling asset prices and rising benefit outlays meant the pension funds were developing huge shortfalls. Meanwhile, employee contributions into the state pension funds actually decreased during this period, as a growing number of Tier 3 and 4 members reached the 10-year seniority mark. Taxpayers were left to pick up the slack, as shown in Figure 3. In 2000, tax-funded employer contributions to New York’s pension funds totaled just under $1 billion. By 2010, they had risen to a combined $17.3 billion for the state and New York City systems. But this was just the beginning of the pension explosion. 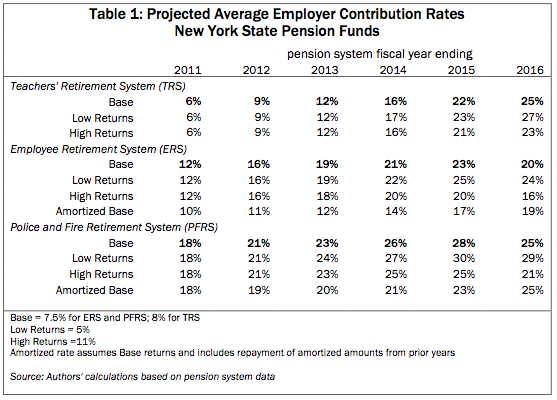 How hard will taxpayers be hit by New York’s coming pension explosion? To answer that question, we have projected employer contribution rates for NYSLRS and NYSTRS for each of the next five years. These projections are based on assumptions about future events, particularly the performance of fund assets, but also growth in employee headcount and salaries. These projections represent our best effort to replicate the funds’ contribution rate calculations under the Aggregate Funding Method used by the pension system actuaries. Because the funds do not make public their expected streams of future cash flows, we must make assumptions about the path of changes in certain figures that form a part of those calculations, particularly the present value of the salaries that currently active employees are expected to earn. However, we believe that these projections represent a good estimate based on publicly available data, and can provide state and local governments with useful guidance about the path of pension costs in future years. We projected contributions in three scenarios: “Base,” in which the pension systems hit their current investment targets (7.5 percent for NYSLRS, 8.0 percent for NYSTRS); “High Returns,” defined as 11 percent per year; and “Low Returns,” defined as 5 percent per year. We also estimated tax-funded contributions to NYSLRS over the next five years assuming that local employers opt to join the state in cap-ping pension contributions and amortizing excess amounts for a 10-year period. Under a new law backed by Comptroller Thomas DiNapoli and approved as part of the 2011-12 state budget, the state government’s fiscal 2010-11 pension contribution rates will be capped at “graded rates” of 9.5 percent for the ERS members and 17.5 percent for PFRS members, instead of the billed rates of 11.9 percent and 18.2 percent, respectively. Starting in fiscal 2011-12, the contribution rates used to calculate the state’s pension bill will be allowed to increase by only one percentage point a year, starting at this year’s capped level. Billed contributions above that amount in any given year can be spread, or amortized, over 10 years, payable to the pension fund at a rate pegged to interest on taxable bonds, generally in the neighborhood of 5 percent. As part of the deal, the minimum contribution level is permanently fixed at 4 percent. Local governments have been given the option of joining this “rate mitigation program,” and many are already choosing to do so. Delayed payments will be counted as liabilities on employer balance sheets, and as receivable “assets” of the pension fund. The comptroller has strongly taken issue with any suggestion that this program is tantamount to borrowing from the pension fund. Semantics aside, however, there is no denying that the cap on pension payments simply transfers liabilities into the future—well into the 2020s, at a minimum. Assuming all local government employers amortize a portion of what they will owe the pension fund, and assuming the funds’ asset returns hit their 7.5 percent target, we estimate a total of $11 billion in state and local pension payments will be deferred over the next five years—stretching these costs into the middle of the next decade. It is possible that stronger-than-expected market performance will bail out state and local governments and blunt the coming spike in contribution rates. Indeed, projections created by the comptroller’s office in support of the original amortization proposal in 2009 assumed that investment returns would match those from 1989 to 2008, not averaged but on a year-to-year basis. If the stock market boom of the 1990s is repeated, the deferred amortization payments will be repaid in relatively short order. But it is equally possible that investment returns will fall below the 7.5 percent target over the next decade, and that the path of contribution rates will be worse than projected in the “Base” scenario projected in Table 1. State and local governments will need to prepare for this possibility rather than simply hoping for strong returns. In any event, even employers choosing to amortize will experience a doubling of ERS contributions and a near doubling in total PFRS contributions over the next five years. If asset returns are high enough to drive down rates quickly after a few years, those employers will continue paying higher rates for a longer period. School districts paying into the NYSTRS, which has no amortization option, will see their contributions quadruple even under our rosiest scenario for asset returns over the next five years. The impact of the projected base rates on total contribution amounts is depicted in Figure 4. The $3.6 billion rise in teacher pension contributions (from about $900 million in 2010-11 to $4.5 billion in 2015-16) equates to 18 percent of 2010-11 school tax levies, or an average increase of nearly 3.5 percent a year. This is well above the annual property tax growth that would be allowed under a 2 percent tax cap proposed by Governor-elect Andrew Cuomo. Virtually all New York City employees (and some employees of the city Transit Authority) belong to one of five different municipal pension systems. The systems have different funding and contribution levels while pooling their assets in a common city pension trust fund. 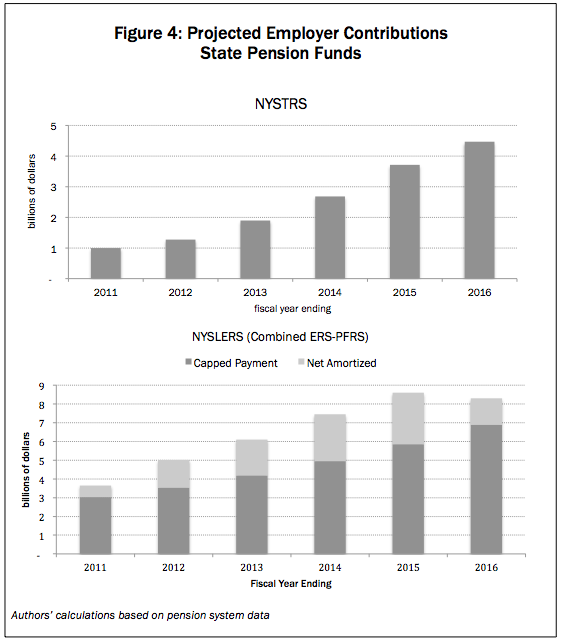 The financing of these pension plans is arcane and complex compared to those of NYSLRS and NYSTRS. Crucial pension fund financial data for the 2009 and 2010 fiscal years has not yet been published, and the city Office of Management and Budget (OMB) uses an opaque process to generate the city’s official pension cost estimates. The city’s pension contribution averaged about $1.4 billion during the late 1990s and dipped as low as $615 million in 2000. By 2010, the contribution had risen to an all-time high of $6.6 billion—and it’s still climbing. OMB’s official financial plan estimates of pension obligations are depicted in Figure 5. These figures, which show the pension contribution growing from $7 billion in 2011 to $8.4 billion in fiscal 2014, reflect changes made by OMB in its November budget modifications in anticipation of a forthcoming revision of actuarial assumptions. Given the steep losses sustained by city pension funds in 2007-2009 (as shown in Figure 2 on page 4) and the underfunded status of the pension plans even before the downturn, the pension contribution is likely to grow significantly after fiscal 2014. Parties obligated to pay an amount at some future date need to know the size of that obligation in today’s dollars, which will tell them how much money to set aside. That sum can be smaller than the principal amount due because it can earn interest until the due date. If, for example, you owe $10,000 in ten years, and your savings account offers an interest rate of 3 percent, you would need to set aside only $7,441 today. In this example, you have assessed your future obligations using a 3 percent “discount rate”—the rate at which the principal due is discounted over a given period of time to produce the loan’s net present value. The discount rate applied to future obligations is a crucial determinant of a pension system’s necessary funding levels: the lower the rate, the larger the contributions required to maintain “fully funded” status, meaning the assets are sufficient to cover all promised pension benefits. Private pension plans must discount liabilities based on what’s known as a “market” rate—typically, the interest paid on bonds issued by financially solid corporations. This is often much lower than the plans’ projected returns, but it reflects what the money would be earning if invested in lower-risk assets, matching the low risk tolerance of future retirees who are counting on their promised pensions. Public funds, however, are allowed to discount their long-term liabilities based on the targeted annual rate of return on their assets—i.e., what they hope to earn from investments in a basket of assets dominated by stocks, which offer a chance of higher returns in exchange for higher risk of losses. Until recently, all of New York’s public pension funds had pegged their target rates at 8 percent, like most other public systems around the country. In 2010, Comptroller DiNapoli, acting as sole trustee of the New York State & Local Employee Retirement System, adopted new actuarial guidelines reducing the target rate for state pension funds to 7.5 percent, along with other changes in actuarial assumptions concerning career duration, salaries and life expectancy. These are all factored into the system’s employer contribution rates going forward. The New York State Teachers’ Retirement System (overseen by a separate board of trustees) and the New York City pension funds will also be considering changes to their rate of return assumptions in 2011. While most public pension managers continue to resist the idea, many independent actuaries and financial economists agree that the net present value of risk-free public pension promises should be calculated on the basis of low-risk market interest rates. Using this approach, for example, Andrew Biggs of the American Enterprise Institute has estimated that state pensions across the country are underfunded by $3 trillion, or six times the officially reported under-funding estimates as of 2008. This estimate doesn’t even take into account the impact of the 2008 market downturn on pension fund asset values. Indeed, sharp drops in asset values cause pension plans’ financial statements to become even more misleading. When a pension plan underperforms its targeted investment returns, it does not recognize the loss immediately; instead, it “smooths” recognition of the loss over a period of years, usually five. This means that most pension plans will not have fully recognized the stock market declines of 2008 and 2009 until 2014. For example, while ERS held assets with a market value of $94 billion as of March 31, 2009, it reported an actuarial asset value of $126 billion on that date—and that $126 billion figure underpins the plan’s claim that it is 101 percent funded. In this report, we also present “market value” funding data for New York’s state and local pension funds, in addition to the more-commonly discussed actuarial funding basis. For the statewide pension funds, we calculated our market value funding calculations by using the most recent available data on market value of assets from the funds’ Comprehensive Annual Financial Reports. In the case of NYSLRS, the data are for March 31, 2009; for NYSTRS, the data are current as of June 30, 2009. We also adjusted the estimated pension liabilities to a “market value liability” calculation by using a discount rate based on high-quality corporate bonds, provided by Mercer Consulting as of September 2010. As is the standard practice for public sector pension funds, these funds’ actuarial liabilities are calculated by discounting future payments to a present value using discount rate equal to the funds’ expected rate of return: 7.5 percent for ERS and PFRS, and 8 percent for TRS. Our adjusted discount rate is approximately 5 percent, varying slightly depending on the funds’ mix of active and retired participants. This lower discount rate reflects the typical practice for private-sector pension plans, with a discount rate based on the risk experienced by pension beneficiaries. 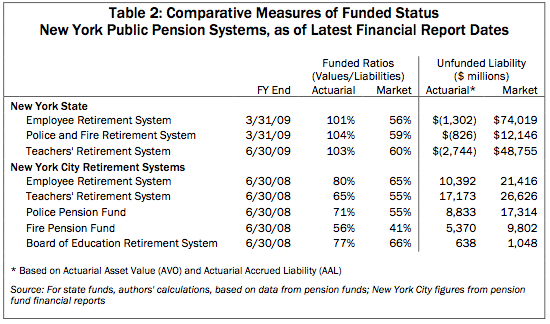 For the New York City pension systems, market valuation measures are already included in official financial reports, so we simply reproduce those along with our estimates for the state funds, based on their latest published financial data, in Table 2. It should be noted that the city’s actuarial and market-based data in the table are for fiscal 2008, and do not reflect the fund’s losses in 2009. The New York City Fire Pension Fund is financially the weakest of the eight public pension funds in New York State. Measured on an official actuarial basis, the Fire Pension Fund had only 56 percent of the assets needed to meet its liabilities as of June 30, 2008; using a market rate standard, its funded ratio was only 41 percent on the same date. Given the city funds’ investment losses, the fire fund’s condition has undoubtedly deteriorated in the past two years. As of their reporting dates in 2009 (March 31 for New York State ERS and PFRS, and June 30 for NYSTRS), each of the state systems reported an actuarial funding ratio of slightly more than 100 percent. But recalculating these figures on a market value basis shows a much worse funding situation: TRS was just 60 percent funded, PFRS 58 percent, and ERS 56 percent. The discrepancy has two sources: sharp stock market declines in late 2008 and early 2009 meant that the market value of these plans’ assets was far below their actuarial value. And changing to a market value discount rate significantly increases the plans’ measured liabilities. In the year following the last official actuarial reporting date, asset values rebounded somewhat. We estimate the New York State ERS and PFRS were 65 percent and 69 percent funded, respectively, using a market rate standard as of March 31, 2010. The market-rate unfunded liabilities for these two systems came to $71 billion, including $61.8 billion for ERS and $9.5 billion for PFRS, according to our calculations. NYSTRS was approximately 61 percent funded as of June 30, 2010, with a shortfall of $49.2 billion. Thus, the combined shortfall for the two systems came to $120 billion, while the official estimate of the shortfall in the city funds, measured on a market basis, came to $76 billion as of June 30, 2008.
he investment losses sustained by New York’s pension funds in the past decade have created deep holes that must be filled. The resulting pension cost increases described in this report cannot be avoided in the short term. Unlike officials in some other states, such as New Jersey, New York officials cannot ignore the problem by skipping or under-funding required pension contributions—if only because New York’s highest court has made it clear it will not allow them to do so. Article 5, Section 7 of New York’s Constitution guarantees that pension benefits shall not be “diminished or impaired”—which is widely assumed to mean that employees cannot be required to help pay for the rising costs for their future benefits, even benefits they have not yet accrued. 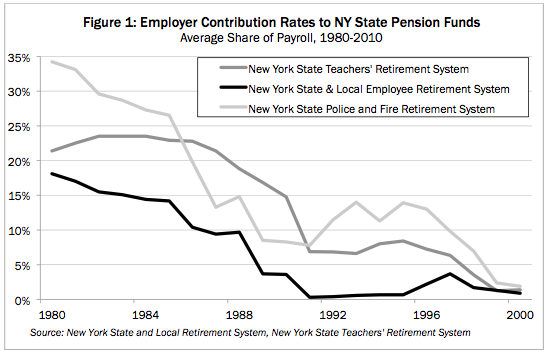 As a result, New York government employees are benefitting from what a leading commentator on retirement finances has called the “public pension straddle option,” which allowed workers to collect bigger benefits financed by excess investment gains in the 1980s and ‘90s, while forcing taxpayers to cover subsequent pension fund investment losses. But it doesn’t have to stay that way. The Empire State can—and should—ultimately eliminate the intolerable financial risks, volatility and unpredictability of the existing pension system. From the standpoint of employers and taxpayers, the best way to accomplish this would be to shift new employees to defined-contribution (DC) plans modeled on the 401(k) accounts now prevalent in the private sector, or the 403(b) plan available to State University and City University of New York employees. Instead of a single common retirement fund, a defined-contribution plan consists of individual accounts supported by employer contributions, usually matched at least in part by the employees’ own savings. These contributions are not subject to federal, state or local income taxes until withdrawn. Funds in the accounts are managed by private firms and invested in a combination of stocks and bonds. In a DB system, the employer promises to finance a future retirement benefit for a large group of current and former workers. In a DC system, the employer’s obligation is discharged immediately, through regular contributions to the retirement accounts of each employee. The size of the ultimate retirement benefit generated by a DC plan depends on the amount of savings and investment returns the worker is able to accumulate over the course of his or her working life. The downside risk of unanticipated investment losses and the upside potential for unanticipated investment gains are both shifted from the employer to the employee. While a growing number of states have been making changes to their pension systems—including 11 in 2010 alone—pure DC plans so far have been mandated in only two states, Michigan and Alaska. In the wake of the November 2010 election, at least six newly elected governors in other states were “looking favorably at some form of 401(k)-style retirement plan for public employees, adding to the momentum building nationally for a shift away from traditional guaranteed pensions,” the Pew Center’s Stateline web site recently reported. 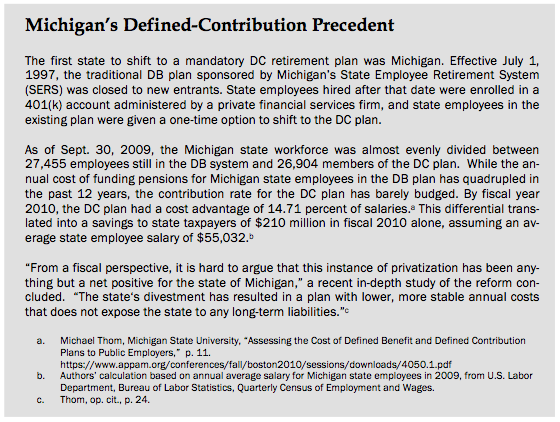 The Michigan experience, which began earlier and covers many more employees, is particularly instructive (see below). An alternative to a pure DC plan would be a “hybrid” combining elements of both DB and DC plans. A model for this approach was recently adopted by the state of Utah, which closed its existing DB plan to newly hired employees. State workers in Utah now have a choice between a pure DC plan or a combined DC and DB plan—but in both plans, the tax-funded employer contribution is capped at 10 percent of salaries. Thus, while employees share in the upside of investment gains, they must also share in the risk of investment losses. The federal government adopted the hybrid model in 1984, when it replaced its own traditional pension plan for civilian workers with a combination of a small DB pension and a DC supplement known as the Thrift Savings Plan (TSP). The downside of a hybrid plan is that, by retaining elements of the DB pension structure, it also retains opportunities for the kind of steady sweetening that occurred when funding levels rose in the current system. The actuarial and financial accounting involved in the DB system is dauntingly complex, inviting the kind of buy-now, pay-later options that politicians often are unable to resist. There need not be a single statewide model of reform. The next Governor and Legislature could create a set of new retirement plan options for local governments, school districts and public authorities to choose from. Some might opt for a pure DC plan and some for hybrids, while others might decide to allow their employees to choose between the two. Pension reform can be justified as a matter of fairness as well as financial prudence. Taxpayers last year kicked in an average of $8.24 for every dollar of employee contributions to the NYSLRS, $6.64 for every dollar of employee contributions to the NYSTRS, and $8.73 for every employee dollar contributed to the New York City pension funds, and those ratios will rise steeply in the next few years along with employer contribution rates. Yet the vast majority of New Yorkers do not enjoy retirement benefits even approaching those available to public employees. Nationally, less than one in five private workers has access to an employer-sponsored DB pension plan; as noted, most of those who have access to any employer-sponsored retirement plan are dependent on 401(k)-style accounts. Where traditional pensions still exist, their benefits are usually smaller—and, of course, are not guaranteed if a plan sponsor goes bankrupt or otherwise lacks the assets to make good on its promises. The average retirement benefit for all state and local government retirees in New York as of 2009 was $27,601—more than twice the average company or union pension of $13,105. While many private pensions are reduced by a percentage of Social Security payments, retired state and local employees in New York collect full Social Security benefits on top of their pensions, which are also exempt from state and local income taxes. The cost of replicating a stream of income equaling a typical public pension would be prohibitive for a private sector worker approaching retirement. For example, as of 2009-10, the median retirement age for teachers in NYSTRS was just over 59, and the median annual pension benefit was $47,000. A male private-sector worker would need to save $860,000 to purchase a guaranteed lifetime annuity paying the same income stream starting at the same age. Teachers in New York City suburbs retiring in their mid-50s can qualify for a stream of pension income that would cost $1.2 million to replicate as an annuity. These figures do not include the value of heavily employer-subsidized health insurance coverage, which most teachers also continue to receive throughout retirement. Retiree health insurance coverage is now even more rare than DB pensions in the private sector. If public employees were instead covered by DC or hybrid DB-DC plans like those described above, they would still receive benefits superior to those available to most workers in the private sector. But they would at least shoulder downside risks as well as upside gains of long-term investments. Taxpayers would no longer be exposed to potentially open-ended liabilities. And a retirement plan requiring workers to share more equally in the costs of their benefits would discourage the seemingly limitless varieties of pension gaming encouraged by the existing system. State officials should not settle for creating a “Tier 6” that incrementally adjusts some existing pension parameters while preserving a fatally flawed system that exposes taxpayers to potentially open-ended liabilities. As New York’s previous experiences with “pension reform” demonstrate, even an ambitious attempt to reduce the costs of traditional pensions (such as the Tier 3 plan of 1976, as further explained in the Appendix) is likely to be undone at the first sign of a market upturn—and the financial implications of such changes will be poorly communicated to and understood by the public. Any pension reform should retain the existing Taylor Law provision prohibiting collective bargaining of pension benefits—and that provision should be expanded to cover other retirement benefits. This is an essential step towards getting a handle on more than $200 billion in unfunded liabilities for retiree health coverage currently promised (but not constitutionally guaranteed) by state and local governments. The state’s pension funds need to release more information about the true extent of the financial risk to which they have exposed taxpayers, who are ultimately responsible for backing up the constitutional guarantee of pension benefits. Robert North, New York City’s chief pension actuary, has become a national leader in this area by reporting alternative measures of funded status for each of the city’s retirement systems, as cited in this report. Following North’s lead, all of New York State’s pension funds should be required by law to annually calculate alternative measures including their Market Value Accumulated Benefit Obligation (“MVABO”), an estimate of which was the basis for our own calculations of funded status for the NYSLRS and NYSTRS funds. Calculate the statistical likelihood that they will meet their average target rate of return over time horizons of five, 10, 15 and 20 years. Such calculations are essential to evaluating all of the potential risks and benefits of policy changes such as the NYSLRS amortization plan. Post their financial results in consistent formats on the Internet, allowing for “searchable” text and spreadsheet versions of numerical tables, including quarterly updates of investments. Calculate projected cash flows—i.e., the benefits they expect to pay over the next 15-20 years, prior to any discounting. These and other headline-grabbing scandals and excesses of the pension system naturally evoke public outrage, and also add to pension costs, but they are mere symptoms of a bigger problem. To borrow a software term, that problem is not a bug, it’s a feature of traditional DB pension plans in the public sector. Offering generous and guaranteed retirement benefits to government workers, while requiring them to shoulder only a minimal and limited share of the cost, inevitably exposes taxpayers to financial risk and volatility. DB pension funds are financially and actuarially complex. They tend to demand new infusions of cash when it is in short supply—in the wake of economic downturns that stretch government finances to the breaking point. Tinkering with existing pension rules to address pension padding, double-dipping and overtime spiking won‘t change that. Other benefit models can provide public employees with retirement security without threatening to crowd out vital services in a future fiscal crisis. DC or hybrid plans also would allow much less potential for abuse and gaming. The necessary next step in pension reform for New York is not to mend the existing system, but end it. Tier 5 covers employees hired on or after Jan. 1, 2010. The cutoff dates for each tier reflect the recent history of legislative attempts to control runaway government pension costs in New York. The most generous pension plan is Tier 1, which requires no employee contribution and allows unrestricted retirement with full pension as early as age 55. Significantly, Tier 1 does not cap the final average salary (FAS) used as a basis for computing the pension. Thus, compared to employees hired after 1973, Tier 1 members have more ability to pad their pensions by working additional overtime in the year or two before retiring. Tier 2, in the early 1970s, raised the basic retirement age to 62. Retirement at age 55 with the maximum pension is still allowed for Tier 2 employees, but is restricted to those with at least 30 years of service. Pensions are reduced for those with fewer than 30 years in the system who retire between the ages of 55 and 62. In addition, the definition of salary used to compute pensions is subject to a cap. Like Tier 1, Tier 2 requires no employee pension contribution. The creation of Tier 3, during the darkest days of the New York City fiscal crisis, marked the first time most state and local employees in New York were required to kick in some of their own money—3 percent of salaries—towards their future retirement benefits. The retirement ages were basically the same as in Tier 2, but the cap on final average salary was slightly lowered. Pension benefits included an annual automatic cost of living adjustment (COLA). Most significantly, Tier 3 also included a feature common to private pensions: the pension benefit would be “offset,” or reduced, to reflect a portion of the retiree’s Social Security benefit starting at age 62. Tier 3 pensions initially were significantly less expensive for employers. Tier 4, adopted just seven years after Tier 3, eliminated the Social Security offset and the COLA. For the first 16 years after its enactment, Tier 4 also required a 3 percent employee contribution. This tier also initially featured more restrictions on early retirement, which were loosened under a series of pension sweeteners in subsequent years. Tier 3 members can opt for a Tier 4 benefit, which in most cases is larger. Under pension enhancements passed in 2000, Tier 3 and 4 workers outside New York City, and most civilians in city pension plans as well, are no longer required to make pension contributions after 10 years of government employment. On December 2, 2009, the New York State Legislature voted to create a fifth tier of slightly reduced pension benefits for state and local employees hired after Jan. 1, 2010. However, while benefits in the new plan are less expensive than those in previous tiers, Tier 5 does not live up to the “significant pension reform” promised by Governor David Paterson when he originally proposed the law. As shown below, the Tier 5 changes for members of the New York State Employee Retirement System (ERS) restored most key elements of the original 1983 Tier 4 pension plan, before those benefits were repeatedly enhanced in the 1990s. The most significant difference between Tier 5 and the original Tier 4 benefits for ERS members involves the use of overtime in computing final average salaries. Unrestricted in all previous plans, overtime for Tier 5 ERS members will now be subject to a $15,000 cap, “indexed” to grow at 3 percent a year. Teachers outside New York City got a different Tier 5 deal: their minimum retirement age will be raised only two years, to 57. The employee contribution for Tier 5 members of the New York State Teachers’ Retirement System (NYSTRS) will be made permanent at a slightly higher rate of 3.5 percent. Members of the Police and Fire Retirement System (PFRS) hired prior to 2010 are mostly enrolled in plans requiring no employee pension contribution. Newly hired Tier 5 police and firefighters (outside New York City, and excluding state troopers) will have to kick in 3 percent of their salaries, and their overtime will be subject to a cap of 15 percent of salary. Tier 5’s overtime limit for uniformed public safety employees is designed to curb the most egregious pension “spiking” abuses, but it still contains ample loopholes for padding retirement benefits. Consider, for example, the real life example of a recently retired Suffolk County law enforcement officer, whose final average salary of $122,841 was padded by an average of $14,639 in overtime and $28,772 in night differential, holiday pay, longevity pay and other allowances. The same “pensionable” amount would have been allowed under Tier 5. However, the officer’s retirement benefit would have been 26 percent lower if it had calculation of “final average salary” had been limited to the base salary alone. New York State United Teachers (NYSUT) achieved its highest pension-related priority—a plan offering some teachers a chance to retire at age 55 after only 25 years of service. NYSUT also won the permanent enactment of a temporary law, annually renewed since 1994, that effectively allows its local chapters to veto any changes in retiree health benefits. Police unions were handed a four-year extension of the temporary law providing for compulsory arbitration of police and firefighter union contracts. The employer contribution rates for Tier 5 employees will be about 20 percent lower than those for employees in Tiers 3 and 4. However, it should be remembered that Tier 3 initially promised even bigger average savings when it was adopted in 1976—only to be undone by the Legislature seven years later. Public employee unions and their allies in the Legislature will naturally pursue “tier equity” in pension benefits as soon as economic clouds lift—and the “reform” process will need to begin all over again. Over the years, various public employee unions have successfully lobbied the state Legislature to create special plans for specific employee groups within the tier structure, such as sheriffs, corrections officers and teachers. As a result, Tier 4 alone also encompasses 11 separate retirement plans. Putting aside the often bewildering array of retirement options available under these different plans, virtually all Tier 3 and Tier 4 employees who have attained the five-year “vesting” point can retire from government service and start drawing at least a partial pension as early as age 55, with full benefits at 62. Civilian retirees with fewer than 20 years in the system receive 1/60 of their salary (1.67 percent) for each year of service. Those with 20 to 30 years receive 1/50 of salary (or 2 percent) for each year. For each year of service over 30 years, the pension includes an addition 3/200 (1.5 percent) of final average salary. In practice, these rules mean the basic pension for a 30-year employee of the state system is at least 60 percent of final average salary, rising to 75 percent for a 40-year employee. When federal Social Security benefits are added to the mix, many career New York State and local government employees can retire at more than 100 percent of their final salaries. Most members of the New York State Police and Fire Retirement System hired prior to January 1, 2010 are not required to make any contribution towards their own pensions. In New York City, employee contributions to the police and fire pension funds are determined by age. However, these pension contributions are partially to fully covered by the city through “increased take-home pay” allowances. 2 Contributions rates in the less well-funded New York City systems as of 2000 ranged from 4.3 percent for teachers to 25 percent for firefighters. 3 Article 19 of the state Retirement and Social Security Law. 4 Contributions to New York City pension funds increased by about 50 percent during this period, principally due to a surge in hiring of police officers and firefighters whose contributions are largely reimbursed by the city with increased take-home pay. 5 Chapter 57, Laws of 2010. 6 Andrew G. Biggs, “The Market Value of Public-Sector Pension Deficits,” AEI Outlook, April 2010, at http://www.aei.org/outlook/100948. 7 New York City uses Treasury bond yields to calculate its market value liabilities, which is a somewhat more conservative method than the corporate bond-based method we use for the state funds. If we had used Treasury yields to re-estimate state pension liabilities, we would have found a slightly higher accrued liability (and therefore a slightly worse funding ratio). 8 McDermott v. Regan, 624 NE 2d 985 – NY: Court of Appeals 1993. 11 “Pension Crisis-The 2010 Utah Response,” presentation by state Sen. Dan Liljenquist, http://www.ncsl.org/documents/labor/Liljenquist_Pensions_LegSum2010.pdf. 12 Guaranteed pension benefits for post-1984 Federal Employee Retirement System members accrue at the rate of 1 percent of salary per year, which is half the maximum level available to New York State employees. 13 Data on contributions are from the 2009-10 financial reports for the respective pension systems. New York City contributions include those for transit workers and bridge and tunnel personnel employed by the state Metropolitan Transportation Authority. 14 U.S. Census Bureau, 2010 Current Population Survey. 15 Estimated payment for a Single Premium Immediate Annuity, partially indexed to inflation on the same basis as the pension, with an insurer who assumes a 3% rate of return. 16 Top scale in most suburban schools now exceeds $100,000. With a final average salary of $100,000, a teacher with 30 years in the system would qualify for an annual pension of $60,000, which would require a single premium of $1.2 million to replicate as a lifetime annuity under the assumptions outlined above. 18 “Cuomo: 90 attorneys’ pensions ‘potentially fraudulent’,” Newsday, April 10, 2008. 19 “86G Pension for Marathon Man,” New York Post, July 6, 2010. 20 “Unions Bankrolled Analyst Vetting Pension Bill,” The New York Times, May 8, 2008, p. B1. 21 Pension information posted at www.SeeThroughNY.netshows 922 police and firefighters in the state system had pensions of $100,000 or more as of March 31, 2010. 22 “Padded Pensions Add to New York’s Fiscal Woes,” The New York Times, May 20, 2010, p. A1. 23 County of Suffolk, “Comprehensive Review of Pension Practices,” prepared by Suffolk County Executive’s Office and the Comprehensive Pension Reform Committee, Oct. 15, 2010. 24 For example, a 40-year state employee retiring at 62 with an final average salary of $50,000 immediately qualifies for a state pension of $37,500 and Social Security benefits of $12,948, yielding a total income of $50,448 that, unlike wages, is free of payroll tax and state or local income tax. Public pension costs in New York are mushrooming—just when taxpayers can least afford it.